Born 5 Feb 1844 Marion County, Indiana, U.S.A.
Died 29 Feb 1924 Maywood, Marion County, Indiana, U.S.A.
Born - 5 Feb 1844 - Marion County, Indiana, U.S.A. This is a Civil War pension, but there were 78 soldiers in Indiana units with the name "John Thomas," but none with "John M." or "John Miller Thomas," so we do not have a unit designation or positive ID. "Residence: 1710 West Minnesota St, Indianapolis IN; known brother, Robert Thomas, all his life; they lived in the same community. Contaiins only the signature of John M. Thomas. All other script was was written by the notary public. "John Thomas, age 26 b. Abt. 1844 Indiana, teamster, wife Lucy, age 26 b. Abt. 1844 Kentucky; one son b. Indiana: Charles seven months," in the household of his in-laws, George & Judith F. Finley." "John M. Thomas, age 36 b. 1844 Indiana, father b. Kentucky mother b. Ireland, farmer, wife Lucy S., age 36 b. 1844 Kentucky parents b. Kentucky; four children b. Indiana: Charles E. 10, William 8, Ervin D. 6, George 3. Mother-in-law: Judith Finley, age 74 b. Abt. 1806 Kentucky, father b. Maryland mother b. Virginia, widowed. Two boarders: Levi Mitchell 20, Thomas Bowen 26." In the adjacent household lived the family of brother "Edward Thomas age 26 b. Abt. 1854 Indiana, father b. Kentucky mother b. Ireland, farmer, wife Martha A., age 21 b. Abt. 1859 Indiana, father b. Pennsylvania mother b. Indiana. Brother [Elias] Nelson, age 24 b. Indiana, father b. Kentucky mother b. Ireland, farm hand." "John M. Thomas, age 56 b. Feb 1844 Indiana, father b. Kentucky mother b. Ireland, day laborer, m. 1868 wife Lucy, age 57 b. 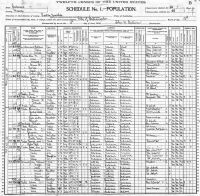 May 1843 Kentucky parents b. Kentucky; five children b. Indiana: William 26 b. Aug 1873 shipper-machines, Erwin D. 24 b. Apr 1876 teamster, George 22 b. Aug 1877 barber, Mary 19 b. Jun 1880 not employed, Arthur John 16 b. Mar 1884." "R. Shotts, age 40 b. Abt. 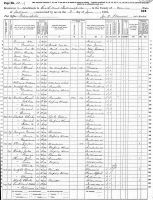 1880 Indiana, father b. Ohio mother b. Indiana, owns home, moulder-foundry, wife M.A., age 39 b. Abt. 1881, father b. Indiana mother b. Kentucky; five children b. Indiana: A.I. 18, A.R. 16, G.M. 14, H.G. 11, M.E. 7." Also in the household: "father-in-law, J.M. Thomas, age 75 b. Abt. 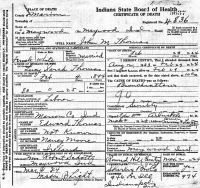 1845 Indiana, father b. Kentucky mother b. Ireland, occupation-none."